Denny Jump (Bellevue, WA, United States) on 9 December 2011 in Lifestyle & Culture. The German brewer David Gottlob Jüngling immigrated to the United States in 1823 from Aldingen, a suburb of Stuttgart, in the Kingdom of Württemberg. He anglicized his surname from Jüngling to Yuengling and began the "Eagle Brewery" on Center Street in Pottsville in 1829. His eldest son, David, Jr., left the Eagle Brewery to establish the James River Steam Brewery along the James River in Richmond, Virginia. The first brewery burned down in an 1831 fire and the company relocated to W. Mahantongo Street at 5th Street, its current location. The Eagle Brewery changed its name to "D. G. Yuengling and Son" in 1873 after Frederick Yuengling joined his father David in running the company. Although the company's name changed, the bald eagle remained the company's emblem. During the late 19th century, breweries were also opened in Saratoga, New York City, and Trail, British Columbia, although they were eventually merged with the Pottsville plant. 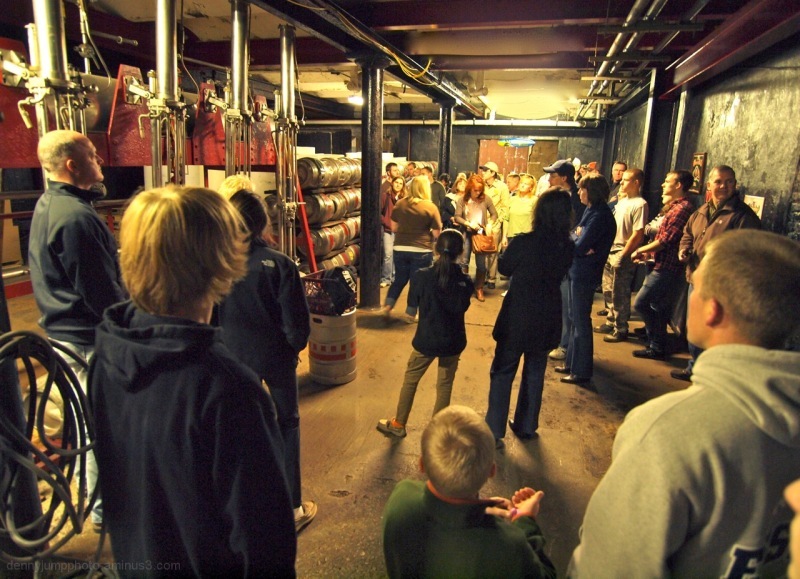 Here we are seen in one of the old Keg filling rooms which is now simply used as a gathering area to explain this process to tour groups. But this was the original room where these functions took place. This was essentially the first stop on the tour following the brief introduction upstairs. The old brewery that we saw in yesterday's shot sits alongside a mountain and many parts of the brewery actually go right into the mountain. We shall see a bit more of that in a few days. Excellent point of view, Denny - and fascinating that the brewery extends into the mountain! Great captured the moment. nice angle. great composition and color tone ! A fine shot of this old brewery's interior. @Richard: Thanks Very much, Richard....I had been using David's Olympus E-600 while my little E510 was in the shop. Iwas really happy with how Dave's camera handled the conditions, but i am confident that mine could do equally well, now that I have an idea what my settings should be.......all this while I wait another year, probably, to gather up enough sheckles for a "real" camera (read nikon). Wow, Denny. I have so much respect that you could make that wise decision (yesterday's post) and stick to it. Congrats for that, my friend. I know others who should do the same, but can't seem to manage it. A great post with warm light and color. It really highlights the blondes in this photo. ;-) Interesting info that you provided as well. Nice light for this shot with everyone's attention on the one explaining the process. Excellent treatment! Superb angle! Well explained! Thumbs up! You really get a sense of place in this shot...Makes me want to visit check it out. Fascinating info here to flesh out the image and the fascinating visit. I have to smile at "He anglicized his surname from Jüngling to Yuengling" . . I'd thought from the new name he was from China ! But, there again, I don't drink beer.